Love it! I had a cat who looks just like your orangeish cat. She was part Siamese and oh the yowl she had! Katherine - Parker (my orange tabby) has good lungs himself. :-) He mostly just mews when he wants my attention or food. The Triad are either curled up together or Edgar is tormenting the girls. Peace or chaos alternate with our felines. 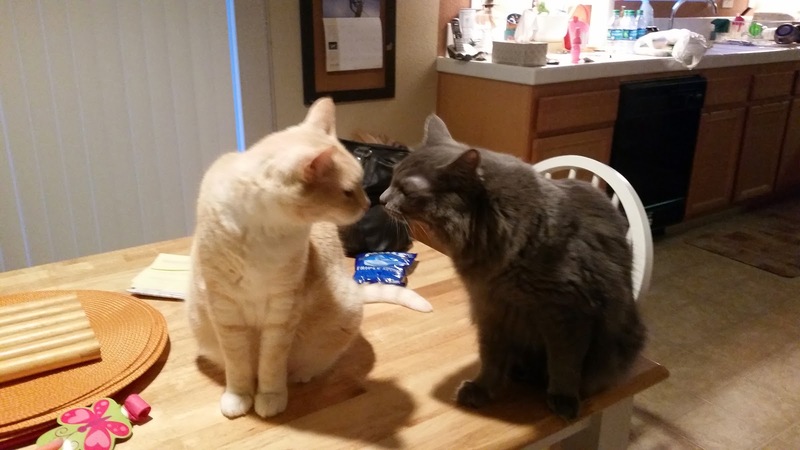 Our 2 males cats do this from time to time and other times they barely tolerate one another. cute pic Wendy. Diane - Thank you. Gracie is extremely playful and she drives Parker crazy sometimes, but they get along very well overall. Aww! You can almost hear the "boop!" sound of their incoming nose-boop! Naida - I've been snapping pictures of them right and left lately. Not sure why. They're just so cute!